During the student revolt of the 1960s, an historic Italian poster proclaimed “La lotta continua”—or, the struggle will go on. Today, it is not students versus state, but economists versus economists. 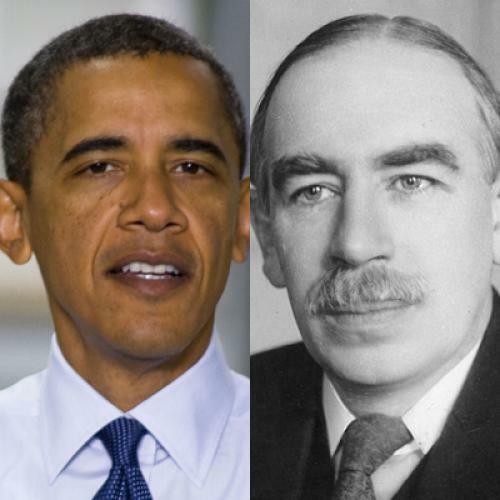 In this corner are the neo- or paleo-Keynesians; in the other are the gainsayers united not by dogma, but by doubt. The latter’s short message: Obama, Summers, Krugman et al. are wrong; stimulus spending doesn’t work. Some in the “Forget Keynes Camp” have run complex regressions, while others have looked at state-by-state statistics to buttress the point. But you don’t need to be a stat whiz. For non-academic purposes, the prima facie evidence is pretty compelling. Let’s first look at deficits, growth, and joblessness. The United States is running a $1.5 trillion deficit, equal to almost 11 percent of GDP, as far as the eye can see—at least until 2014. This is the biggest stimulus since FDR cranked up the war machine post-Pearl Harbor—to almost 30 percent of GDP in the 1940s. Yet U.S. growth today is down to 2.4 percent, having halved since the beginning of the year. And unemployment holds stubbornly steady at 9.5 percent, with the U.S. economy having shed 131,000 jobs in July. Now, let’s play a simple game of correlation—like the familiar one between rising hemlines and soaring stock markets (don’t knock the skirt-Dow Jones link as a spurious one; it may well be a surge in optimism that drives up both). On the one hand, the United States spends the most, but gets the least. Ditto among the large European countries. Britain runs a deficit even higher than the United States—11.5 percent of GDP—yet the joblessness rate of 8 percent is still rising, in comparison to last summer. The French government is in hock for 7.5 percent, and its unemployment of 10 percent is the highest in a decade. On the other hand, there is Germany, the number one economy in Euroland. Its deficit is around 5 percent this year, and falling. But it enjoys robust growth, and its trade account is expanding as well. Imports grew by 17 percent in the first two quarters, exports by 14 percent, meaning that Germany actually is not a drag on the global economy as it buys more from the rest of the world than it sells to it by way of Beemers and beer. But the best part of the story is about jobs. German unemployment (7 percent) is now just below where it was before the crash, and falling. So the deficit hawks have a point: Higher spending doesn’t translate into job growth, but relative frugality, as the German case shows, does go hand in hand with job creation. Cheap money, another Keynesian tool of choice, doesn’t seem to make a difference at all because interest rates are at rock bottom everywhere. Case closed? In economics, things are always more complicated. As the joke goes, this is the reason why there are no one-handed economists; they are always saying: “on the one hand, on the other…” But, in the second year of the stimulus, it has become a lot harder to argue that Keynes is cool, and it is a lot easier to contend that tightfisted Angela Merkel, though a physicist by training, has a better knack for economic management than the Bloomsbury Sage—at least 74 years after he published his General Theory. OK, it is silly to draw so much conclusion from so little evidence, and, whatever the gainsayers argue, Obama will throw more money at the economy as the midterms draw closer. But think of the issue in the simplest of terms: As a businessperson or consumer, would you now spend your money in the face of a rising deficit that is guaranteed to bring on either inflation or tax hikes or both? Maybe you can find the answer in the Holy Writ that is the General Theory. Confidence matters, and this is what the great man had to say in Book III: “The government program may, through its effect on ‘confidence’, increase liquidity-preference or diminish the marginal efficiency of capital, which may retard other investment...” Translation by Joffe: “The stimulus may lead to cash-hoarding and, by depressing the return on capital, diminish private investment.” Keynes may have been wiser than his disciples. Josef Joffe is the editor of Die Zeit and a Senior Fellow of the Institute for International Studies and Abramowitz Fellow of the Hoover Institution, both at Stanford.